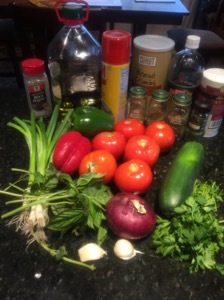 I loves me some gazpacho. One of my most favorite recipes ever is this one. 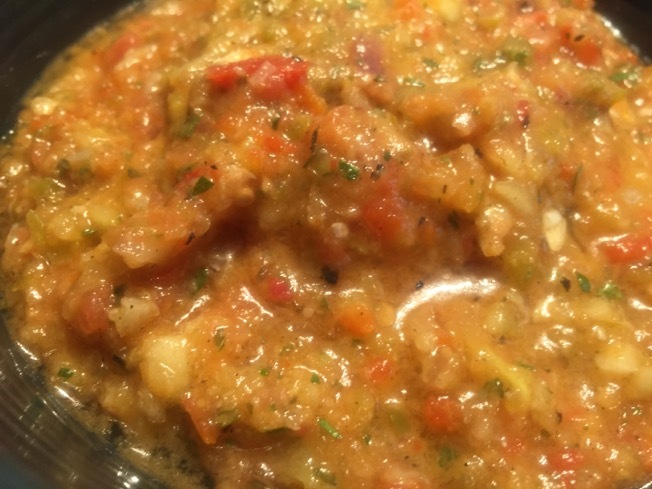 Where the flavors are so pure and fresh in the original gazpacho, the recipe below has hints of the grill. A perfect way to have your cool summer dish grilled! Look at all those nice veggies on the grill. 1. Soak wood chips in water 30 minutes; drain. 2. Remove grill rack; set aside. Preheat grill to high heat. Place wood chips on hot coals; heat wood chips 10 minutes. Coat grill rack with cooking spray; place grill rack on grill. 3. Finely chop green onion tops; set aside. Thread white parts of green onions onto a skewer. Thread red onion quarters onto skewers. Thread garlic cloves onto a skewer. Lightly brush vegetables with oil. 4. Place green onion, red onion, and garlic skewers on the grill; grill 1 minute on each side or until darkly browned on the outside but still raw in the center. Remove from grill; cool. Place bread on grill; grill 1 minute on each side or until darkly toasted. Remove from grill. 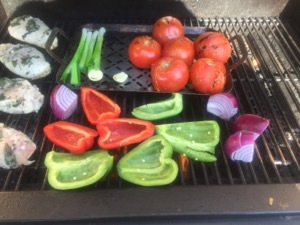 Place tomatoes and bell peppers on grill; grill tomatoes 2 minutes on each side or until skins are charred. Grill peppers 3 minutes on each side or until charred. Remove from grill; cool. Scrape and discard charred skins from 3 tomatoes and both peppers with a paring knife. Remove and discard seeds and membranes from peppers. 5. Combine grilled vegetables, bread, remaining oil, cucumber, and remaining ingredients in a blender or food processor; process until smooth. Chill 1 hour. 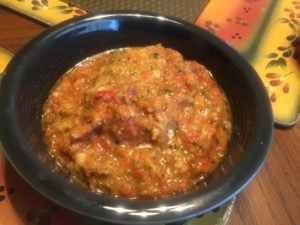 Ladle 3/4 cup gazpacho into each of 8 bowls; sprinkle with green onion tops.